In recent months, markets looked on as the Turkish lira repeatedly set new all-time lows with mild—or perhaps morbid—curiosity. But a fresh round of US sanctions against Turkey today turned the lira’s decline into a full-blown rout that is rattling global markets. The lira lost 16% of its value against the dollar at one point in intraday trading, as reports emerged that the European Central Bank is fretting about banks’ exposure to the increasingly shaky Turkish borrowers. Some 40% of the Turkish banking sector’s assets are comprised of foreign-currency loans. 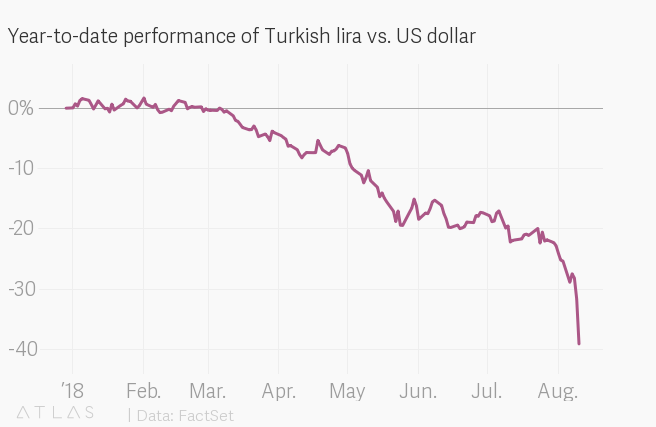 The lira has lost nearly half of its value versus the dollar over the past 12 months alone. Donald Trump said he would double tariffs on Turkish steel and aluminum imports. The diplomatic row between Ankara and Washington deepened overnight after a Turkish delegation to Washington failed to break an impasse (paywall) over Turkey’s refusal to free Andrew Brunson, an American pastor detained amid the tumult of the failed July 2016 coup against Turkish president Recep Tayyip Erdogan. 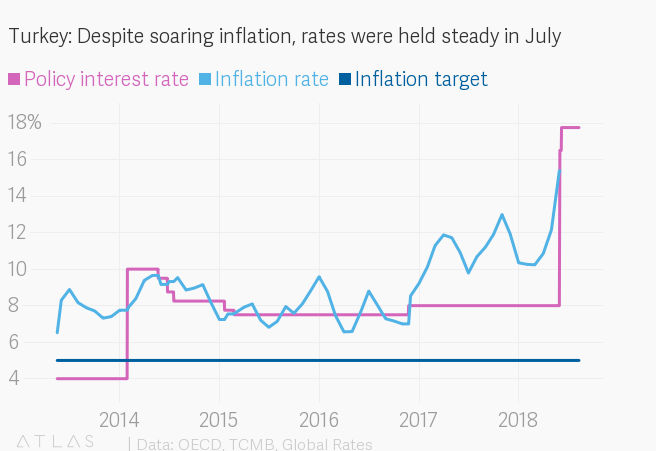 That adds to domestic woes: Erdogan’s authoritarian grip on power saw the country’s central bank hold interest rates steady last month, at 17.75%, despite inflation soaring to more more than triple the bank’s 5% target. This morning, a speech by Erdogan failed to quell fears of a currency crisis. (“If they have their dollars, we have our people, our God,” he told the crowd.) Despite his urgings, the currency weakened further—to yet another all-time low—and stock markets around the world slipped into the red.